She is the first guest who visited the exhibition right after it started. She has been interested in the culture of Kyoto ever since she had traveled to Tokyo. So she stopped by our exhibition when she was passing by. Firstly, we welcomed her with “Matcha (=green tea)” and “Crane and Turtle shaped kouhaku-higashi (Japanese traditional sweets)”. After that, she tried our wedding costume. 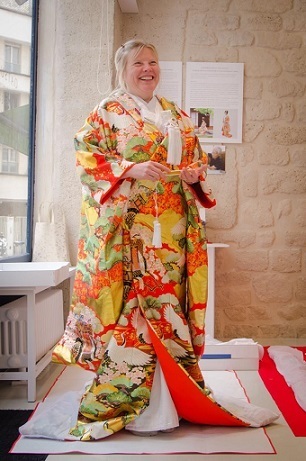 So many people stopped to see our exhibition and got interested in kimono and Japanese culture. 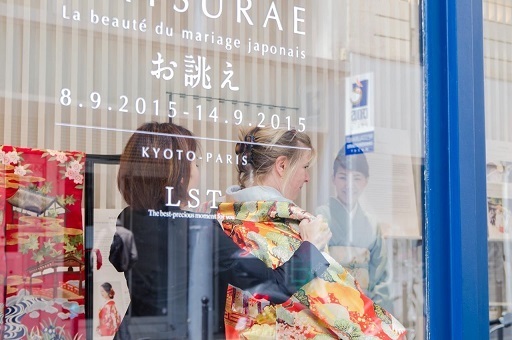 By holding this exhibition in Paris, we could find the new charm of the traditional Japanese wedding from the different perspective. A lady in Paris who tried our costume also had a charming smile like brides in Japan.